It seems that the water cooling company XSPC is selling fans now. 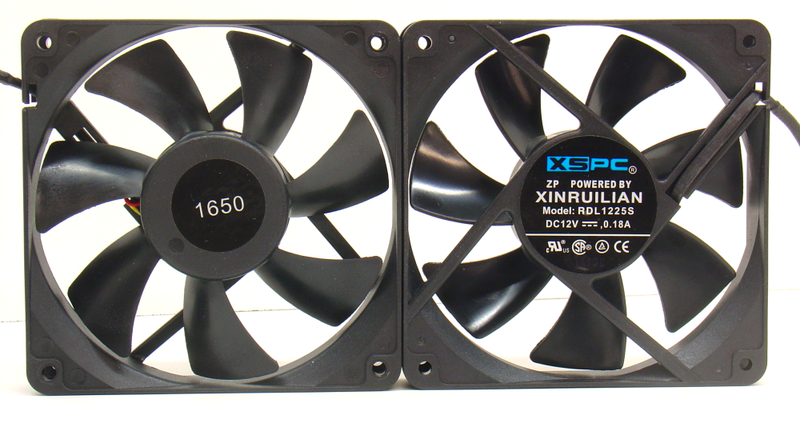 They have released a line of Xinruilian fans based on the RDL1225S and the RDM1425S. 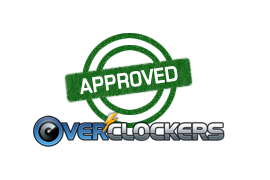 Last fall, Koolertek contacted me wanting to know how well these fans performed. They sent me some samples, and I included two of the 120 mm in the fan studies I was doing on the NH-D14 at the time. 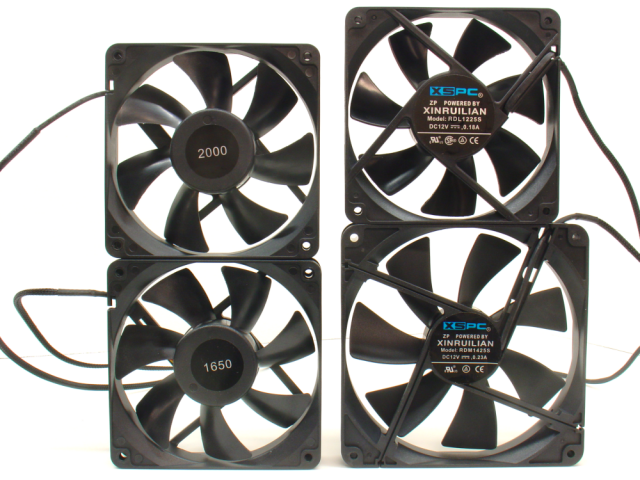 Now Koolertek has sent me a third 120 mm fan in the same lineup, and we can look at the whole line of fans. When I looked at these fans I didn’t expect they would perform well. According to XSPC, these are “Fans designed for XSPC Radiators.” But where are the broad chords on the blades that one usually associates with high static pressure fans? But testing is the measure of a fan, not its looks. The 120 mm fans are solidly built. They are so solid I didn’t believe they were sleeve bearing fans until I peeled back the label on one and inspected it. I suppose it should not come as a surprise that the Xinruilian website shows that ball bearings are available for these. They seem built for them. In the above shot you can also see that the 120 mm fan has open corners, while the 140 mm fan’s corners have an enclosed bolt passage in the corner. The 140 mm fan also has four LED ports, probably for 3 mm LED’s. In the picture you can see a channel for an LED wire from the hub to the periphery. As for color, the fans offer black frames, black blades, black heatshrink, black sleeving, black plug — it is all guaranteed to vanish into your system: the model unobtrusive fan. I never believe brand sellers when they publish specs. I always take measurements. I measured these by putting my SPL meter 10 cm in front of the intake face of each of these fans as it ran in free air. By subtracting 20 dB from my results I got the sound pressure level you should expect at one meter away. The fan speeds I measured with a motherboard utility. XSPC gives their sound pressure levels as approximations. That is much more believable than numbers like 18.35 and such. The CFM and static pressure numbers imply more precision than anyone can measure. The RPM and SPL specifications are amazingly accurate. The fan cables measured 50 cm long, about 19.5″ from frame to plug tip. This would allow water coolers to place their rads some distance from the PSU. The KM2-1700 is a Scythe Kaze Maru 2 fan rated at 1700 RPM. It is also called a Slip Stream 140. It and the Noctua NF-P14 are 140 mm voltage controlled fans. The TY-140 is a 140 mm PWM fan sold by Thermalright. We expect sleeve bearing fans to wear out faster when oriented to push air upward. Some even have trouble pointed downward. I held each of these fans in various orientations to feel their vibrations. RDL1225S 1200 RPM: no vibration at any orientation. RDL1225S 1650 RPM: mild vibration, no change at any orientation. RDL1225S 2000 RPM: vibration at all orientations, but no change for any orientation. It reminded me of the Slip Stream 1900 RPM fan, which runs faster than it should. This should not come as a surprise, since Xinruilian lists the 120 mm RDL as a 1700 RPM fan. 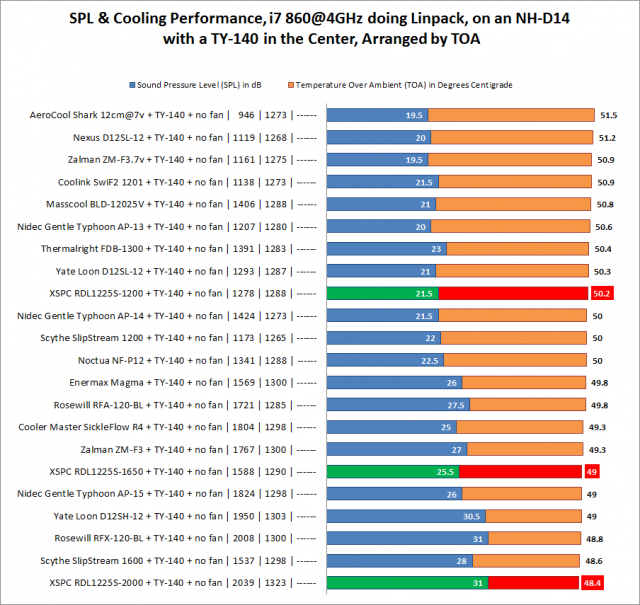 The RDM1225S is rated at 2000 RPM, but that is not the fan offered by XSPC. I recommend buying a spare if you use this fan (for the price you can afford a spare). 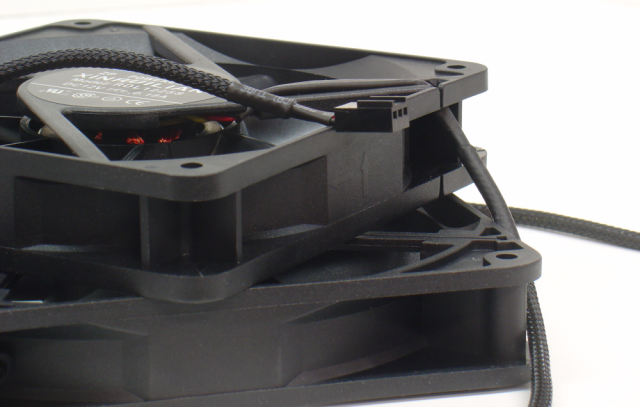 RDM1425S 1350 RPM: little vibration at most orientations, but increased vibration when the fan’s output is pointed up. I would not recommend using it in that orientation. Even though they are inexpensive, these are impressive fans. The 120 mm fans are handsome and solidly built. 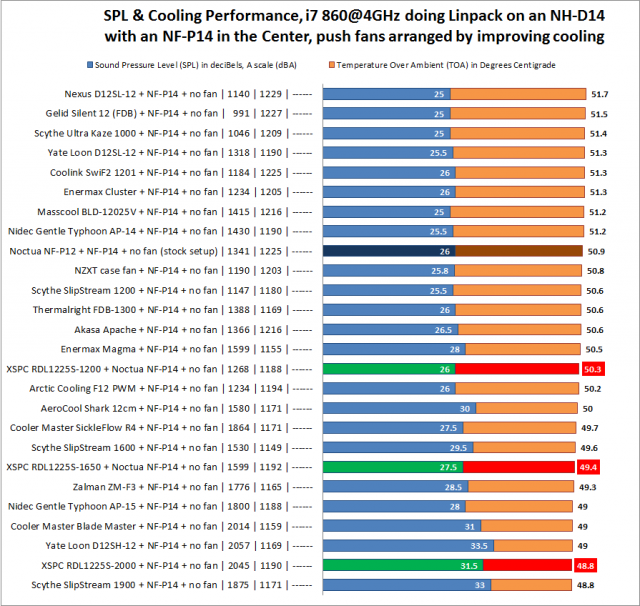 Their RPM specs are accurate, and their SPL specs are honest. Sleeve bearings, though this may not be a problem for the 120 mm 1200 RPM and 1650 RPM fans. You should always lubricate sleeve bearing fans before you mount them. A how-to article is here. I thought they did pretty well. Actually, they did very well for seven dollar fans. 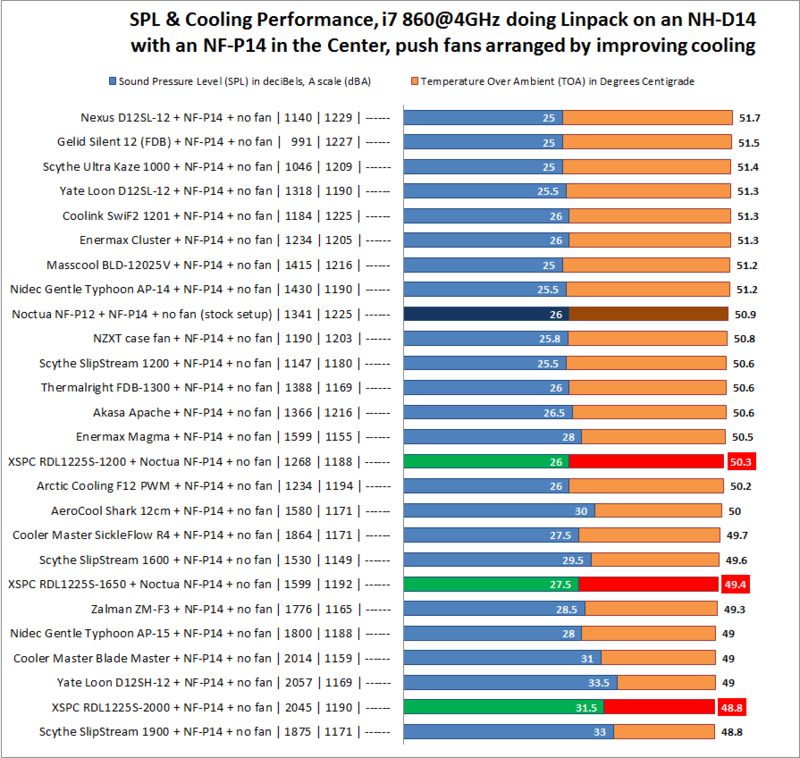 They cooled better and were less noisy than many of the more expensive fans. Thank you to Koolertek for providing the fans. It's good to see some more good quality, inexpensive fans on the market. Im curious what you thought of the 140mm fans. Right now I am running yate loon highs on my 2x magicool 280 radiators. They are far stronger/louder than I need them to be. Im running at ~50% speed on them but my RheoSmart has PWM control. 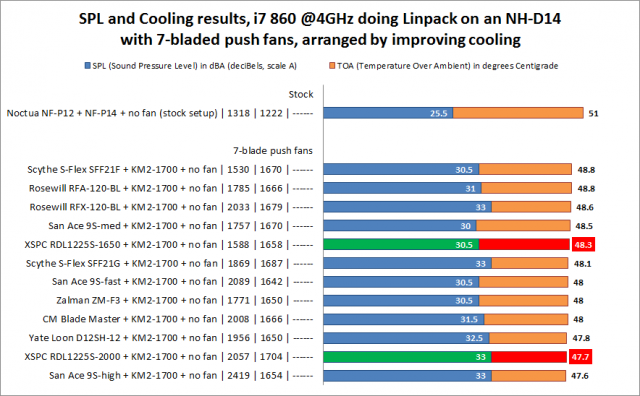 Unfortunately once my CPU hits ~45c the fans ramp up way higher than they need to be. Do you think that these XSPC fans might be a suitable replacement? I don't know. 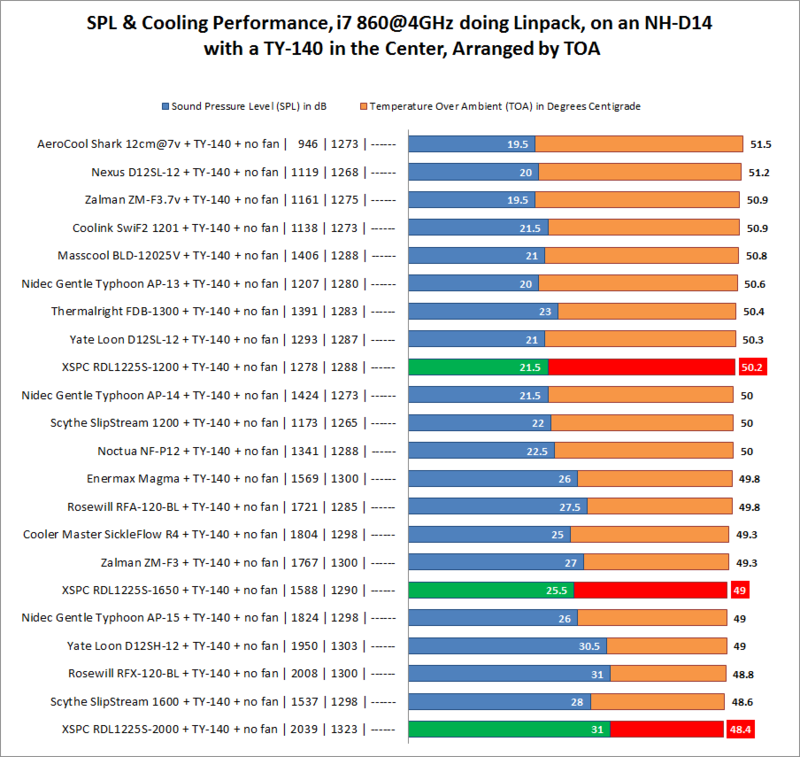 The 140mm fan did not even seem to be made by the same company, except that it was dressed the same. Right this second I can't find it on Koolertek, and I can't find the RDM1425S or the RDM1425S on the US/Canadian side of the pond. If they were available, I'd say to buy a pair and try them out. They were fairly inexpensive when they were available, and XSPC seems to have picked winners with their other fans. If that rad of your can handle 120mm fan holes, or if you could make adapters out of sheets of polysterene, I would recommend Kaze Maru's or Kaze Maru 2's. Or you could get YL mediums. The Xinruilians seem more substantial than the YL's. Really nice review! I've got a pair of the 1200's in my case. @ almost 50cfms I can barely hear them.